(1) The calibrated initial fatigue crack length, aj, were determined for the fatigue reference stress ranges at 2 million cycles in case of (1) a uniform tension and (2) a stress gradient. 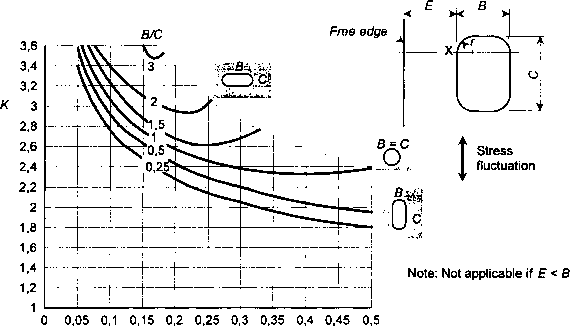 The proposed conservative envelope of the fatigue crack growth curves as shown in Figs.B.3.3-B.3.5 and listed in tables B.3.3 to B.3.5 were used. The fracture mechanics model was a half disk surface crack in a 12mm thick and 200mm wide plate subjected to the two loading cases (see Fig.B.7.1). (5) The surface stress of three times the global stress decreases parabolically, reaches the global stress 2mm below the surface and remains constant through the rest of the thickness at the same reference stress range as in the first case. The fatigue life is equal to the fatigue crack growth from the initial crack length, a*, to the final crack length, af, given by the plate thickness. The phenomenon of short crack fatigue crack propagation is approximated by using the K^ constant FCGR curves in the region, where the crack length is smaller than 2mm. From 2mm upwards the FCGR curves corresponding to the applied R ratio (R=Kmn/Kmax) are used. In the case of the cast aluminium alloys the Kmax constant curves were approximated by the R = 0,8 curve of the R constant FCGR set. (6) Tables B.7.1. (a) and (b), for wrought and cast alloys respectively, show variations in predicted maximum tolerable initial crack size as a function of fatigue reference stress range, R-ratio and stress pattern. (7) Tables B.7.2 to B.7.5. show the variations in predicted fatigue life under a stress range of 80N/mm2 as a function of initial crack length a*, fatigue crack growth curve. R-ratio and stress pattern have been used.